I've just started replaying Being Thief and my instructions scroll is completely blank. I know it probably has something to do with the ep? but I don't know how to fix it. I clicked on "Playing Being Thief and the instructions are blank" in the Thief FM forum and it brought me here! Edit: when I clicked on the above it took me to the actual release thread for this mission, but after I submitted my post I see that I am in the correct thread. What's happening here? Never mind.. I see that llanita's post was moved at the same time. When you say "instructions scroll", is that a scroll you're trying to read in inventory or do you mean the objectives screen? It's a scroll in the mission that Garrett needs to read before he leaves his room, in inventory. Ok. If that scroll doesn't work, it's possible none of the readable items in the mission will work. Have you encountered any others and tried to read them? Which FM manager you use? I don't know yet what could be the problem, just I'm trying to figure out. Maybe a wrong fm installation? I do not know what's wrong there . I tried with ND 1.21, 1.22 and 1.23, with and without EP2 and TP, but found nothing wrong, at least in readables. The folder I mentioned in my previous post was the book folder in the fm Being Thief. Those are the ones I can read when I click on them in the directory. Ok I just found a Books folder in my Documents folder! No idea what its doing there. I looked and it has the same files as your image does. Should I just drag that folder into the t2 folder? Last edited by llanita; 22nd Jan 2016 at 09:34. No, don't put the books folder in your T2 folder. You are using FM Sel. FM Sel does not install FMs into the T2 folder itself. It puts them in a separate FMs subfolder inside the T2 folder. I can see that FMs folder in the picture you posted. Go into that FMs folder and find the Being Thief folder. Inside that, there should be a books folder with the files that are in Ricebug's picture. They shouldn't be in the T2 folder. But if you're nervous about deleting them, you can always just drag them somewhere else, as you did the books folder. 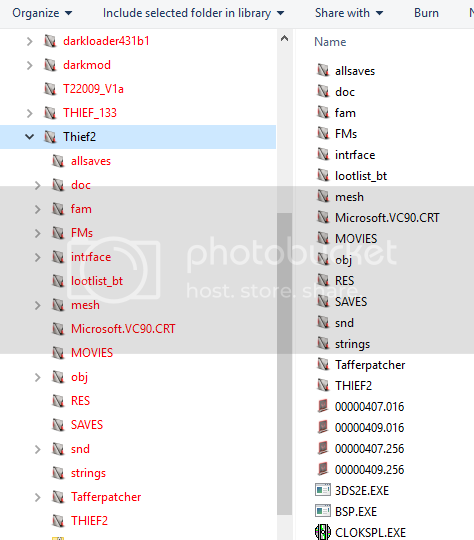 If you're using FMSel the 'books' folder, based on your screenie, should be located at ...\Thief2\FMs\being_thief_v1_1\books. Ricebug uses Darkloader which works differently. So look for it there and if it's not then your Thief2 install is messed up and should be reinstalled as probably the simplest way to fix the problem. I'm an hour into replaying this classic and all readables are working fine (NewDark 1.23 using FMSel with all the graphical enhancements (EP2, etc) from Tafferpatcher). Some paintings are blank though, but appear correctly if I disable the enhancements (put a semi-colon before the line in cam_mod.ini), which happens with some pre-NewDark FMs. Edit: yes, do what Tannar says and delete/move those folders and I bet your readables/etc will work again. This happened from using Darkloader in the past with this Thief2 install. Last edited by Dahenjo; 22nd Jan 2016 at 10:42. Yes yes. You have there a FM installed with Darkloader also, that's a problem. If you want to know which FM is, check "strings/titles.str" file The path to BT readables installed with FM Selector looks like: yourT2dir\FMs\being_thief_v1_1\books\english\ . Last edited by Sensut; 22nd Jan 2016 at 11:54. Ok I deleted all those files. Also looked where Sensut said and they all show up. I wasn't looking under the english folder, just under Being Thief/books. So I'll go check the mission again and will let you know if that worked. Just checked...all present and correct! Thank you all so much for your help. Truly appreciated. These forums are the best. You can also get rid of the Snd folder and the Microsoft.VC90.CRT. Having trouble with finding that shed with the "Contract Depository". I take it it may be the building you can walk completely around near my start out back? I can get in the roof but all there is is a room with some machines. Seems to be no way in. Any help would be appreciated. Thanks. Last edited by Lightningline; 28th Oct 2018 at 16:36. @Lightningline: I think you're in the wrong thread. Looks like you are playing Being Thief 2. Where is the contract depository? What is it, exactly? you. Enter the door next to the guard to find what you're looking for. take on all jobs at once, or just the ones that interest you. Last edited by jiansonz; 31st Oct 2018 at 14:23. This is the Being Thief thread and yes its exile "A busy night" mission. Thankyou for your help...if I am indeed in the wrong thread please point me to the correct one and possibly Ricebugs Walkthrough in case I need any help. I found the extra missions...looks like I'm gonna have a busy day. Lots to do. I saw that but Cavador has a walkthrough. I have done everything surrounding the spider robot but none of the extra missions because I kepped going the other way to go out back. To me the scrolls are actually beside my start point. Oh well. Looks like I got lots to do. A real treat should be the name of this FM. Thankyou much for setting me on my way. "Here we go" Why is this thread called Being Thief also. Its confusing. Sensut, I completely forgot about this mission, and it's just fantastic! Thank you!